In 1957 Morrie Hill – the Auckland Star’s Wellington-based photographer – visited the record manufacturing plant of His Master’s Voice (NZ) Ltd, which was based in Lower Hutt from 1954 until its closure in 1988. 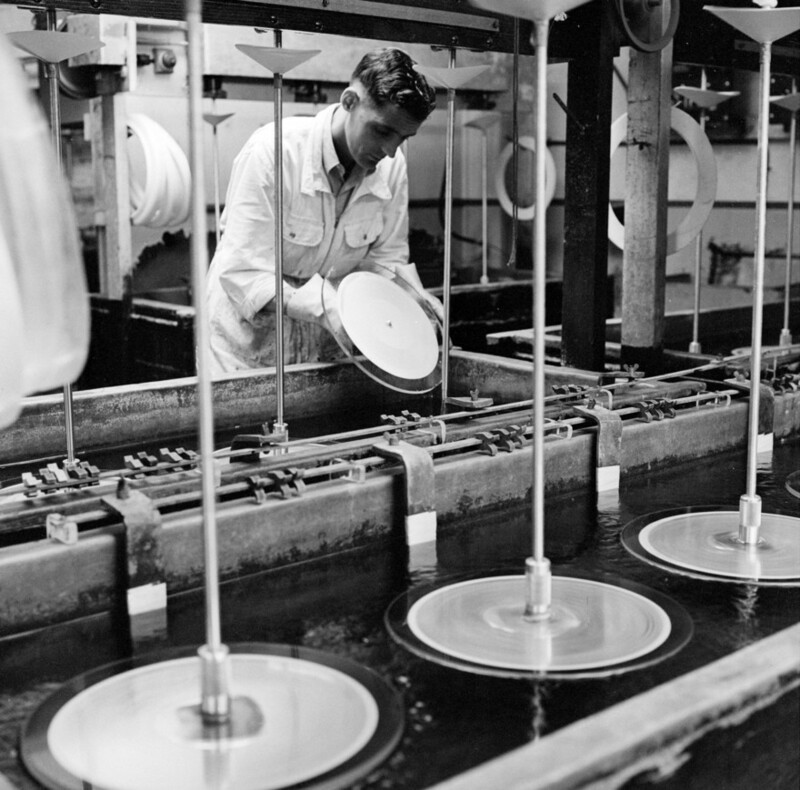 His photo essay, published on 15 April 1957, shows the manufacture of a record from a master tape airmailed from overseas, to the finished product: a disc to sell in a store. HMV began making 12" 33-1/3rpm albums in 1955, and had phased out the manufacture of 10" 78rpm discs by 1958. 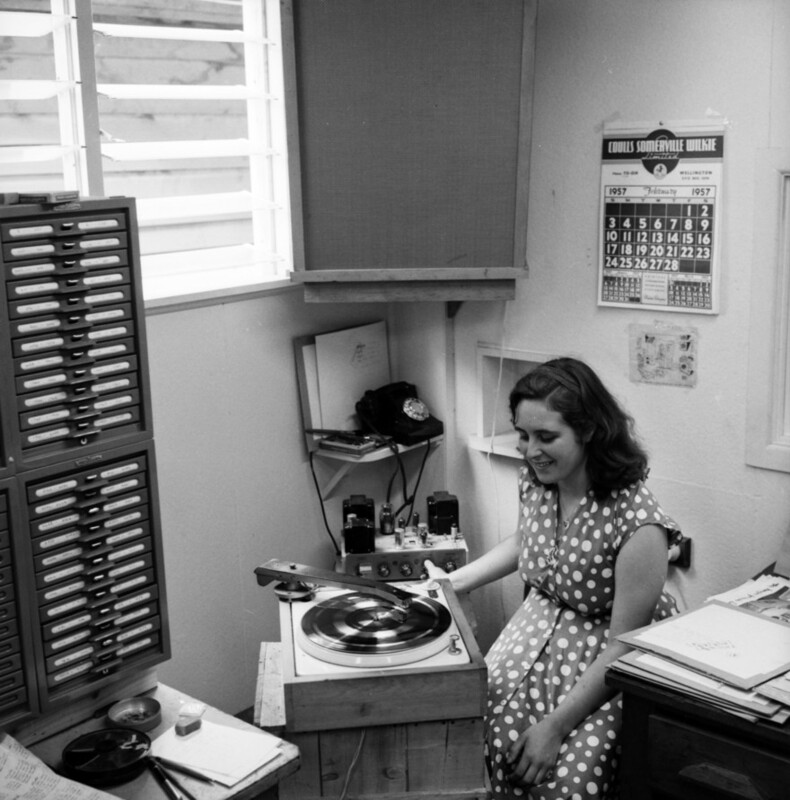 The first LP record pressed at Lower Hutt was The Winifred Atwell Selection in 1955. In the 1950s HMV dominated the manufacture and sale of records in New Zealand. However they did not release the first record pressed in New Zealand: Radio Corp, owner of Tanza, released its pressing of US pop organist Ken Griffin’s ‘I'm Looking for a Sweetheart’ on its Tempo label in late February 1949. Nor did HMV release the first disc recorded and pressed in New Zealand (‘Blue Smoke’, recorded in October 1948, was released on Tanza in June 1949). HMV New Zealand's first local pressing to be released was Dinah Shore’s ‘Button and Bows’ in March 1949; the disc was made in its newly opened factory in Kilbirnie, Wellington. The British-owned firm had little interest in local music until after the independent label Tanza released ‘Blue Smoke’. Although HMV released some New Zealand artists shortly afterwards – by country singer Les Wilson, Wally Ransom’s Rumba Band, and vocal group the Knaves – it would be nearly four years before HMV really embraced local music. Yet in the early 1950s, when the independent labels such as Stebbing and Tanza showed commitment to local acts, HMV did what it could to prevent their releases being widely distributed. HMV had enjoyed a virtual monopoly on the record industry since the 1920s, and was slow to react. However they made up for lost time recording local acts in the 1960s and early-mid 1970s. 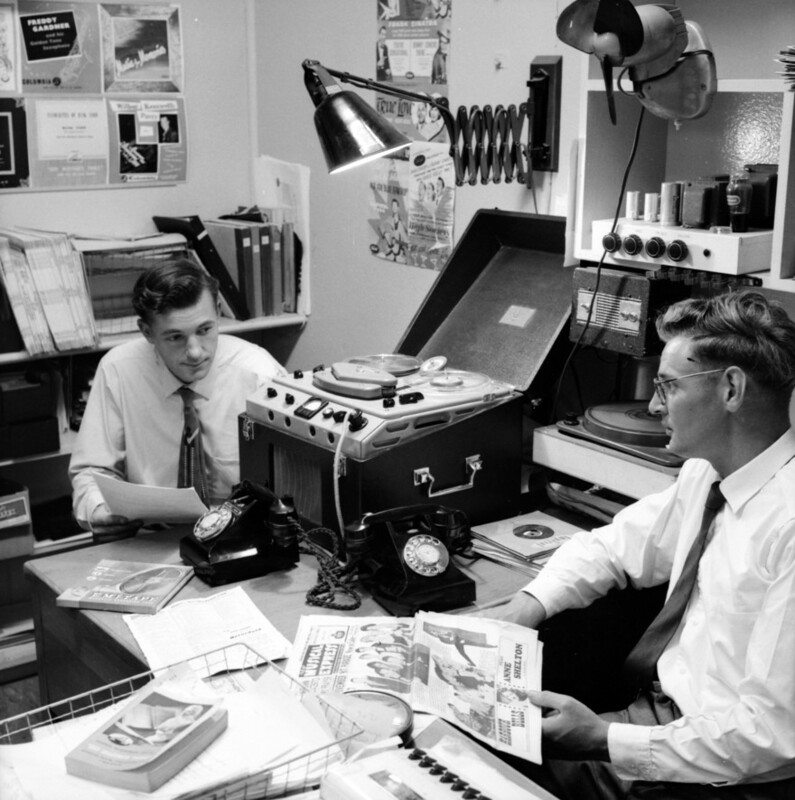 Dave van Weede, HMV’s A&R man in the mid-1950s, is seen here in his office selecting songs to release from a reel-to-reel tape that had just arrived from Britain. It was Van Weede who asked Johnny Cooper – already a country star with ‘One By One’ – to record New Zealand’s version of ‘Rock Around the Clock’; he also turned down Phil Warren’s pitch for Johnny Devlin to be on HMV. These photographs by Morrie Hill are from the Alexander Turnbull Library collection. Thanks to John Shears, formerly with Tanza, for help in explaining the manufacturing process. If you go to a party tonight, most likely you will listen to records, whether they be classical, pops or jazz, that have been made in New Zealand. The story behind their manufacture is interesting and not a little complicated. A big firm in Wellington each week received by airmail tapes of records from American studios. From these tapes tunes are carefully selected to satisfy local taste. There follows the process of manufacture, which ends with records ready for sale a few days after the arrival of the tapes. These pictures show the process, step by step. In three years the Wellington factory has built up an output exceeding 50,000 records a week, and the quality of the product compares favourably with records manufactured overseas. The firm makes long-playing and normal records and through its overseas connexions, is able to make releases here before similar discs are ready in Australia. The initial step in the manufacture of records from tape is the job of Dave van Weede and Ray Isaac. Two nights a week they listen to newly arrived tapes. By studying overseas popularity charts and keeping in touch with local hit parades and request sessions, they are able to select from the tapes the numbers that will sell. The selected tapes are then cut on to acetates. The tapes music is carried through a pick-up whose “needle” is a cutting tool. The “needle” cuts grooves into the acetate (a blank disc of soft material) according to the electrical impulse activated by the music. The acetate becomes a record with a very short life. 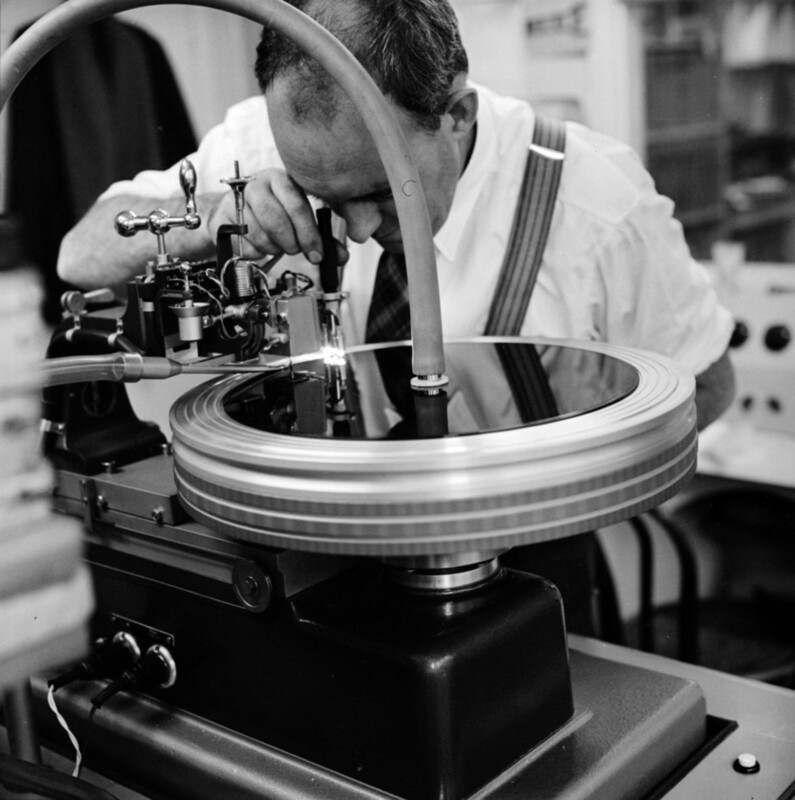 At a cutting lathe, the sound is fed to the lathe and the sound waves are converted to grooves in the record via a sapphire cutting stylus, ground to a specific design to ensure a clean cut and a continual delivery of “swarf” (the waste acetate). Acetate is a relatively soft material and was coated on to an aluminium base. These master acetates were never played before processing, they were too fragile and the quality of the finished record would have been compromised. While the acetate is being cut, a constant microscopic check is kept to see that the grooves have no defects, such as bulging into each other. The strip of acetate which is removed by the “needle” is disposed of through a tube so that it does not foul the cutter and ruin the acetate. Checking the acetate for defects using a microscope, from another angle. From the acetate, the master disc is made. In this process the acetate surface is given a film-thin coat of silver by electro-plating, and then backed with copper to a thickness of 1/16th of an inch (1.6mm). At the plating tanks, the acetate original is converted to the stamper or matrix used to the press the record. The plating tanks are filled with a copper sulphate (bluestone) solution, plus other additives. In the tanks, large anodes of copper are deposited onto the acetate by standard plating techniques. It is a three-stage process. First, the acetate is coated with a silver solution which is then plated with copper. Once separated from the acetate master, the silver removed and then coated with a flash coating of nickel to protect the softer copper. This was a called the “mother”. The second process is similar but no silver coating is needed. This was called the “father” and is as the original recording but in metal. The third stage is to repeat the plating process to produce a matrix (aka “stamper”) which is further protected by the use of a final chromium plated layer to enhance its longevity. After further mechanical work to make the stamper ready to fit into the press die it can be delivered to the press shop. 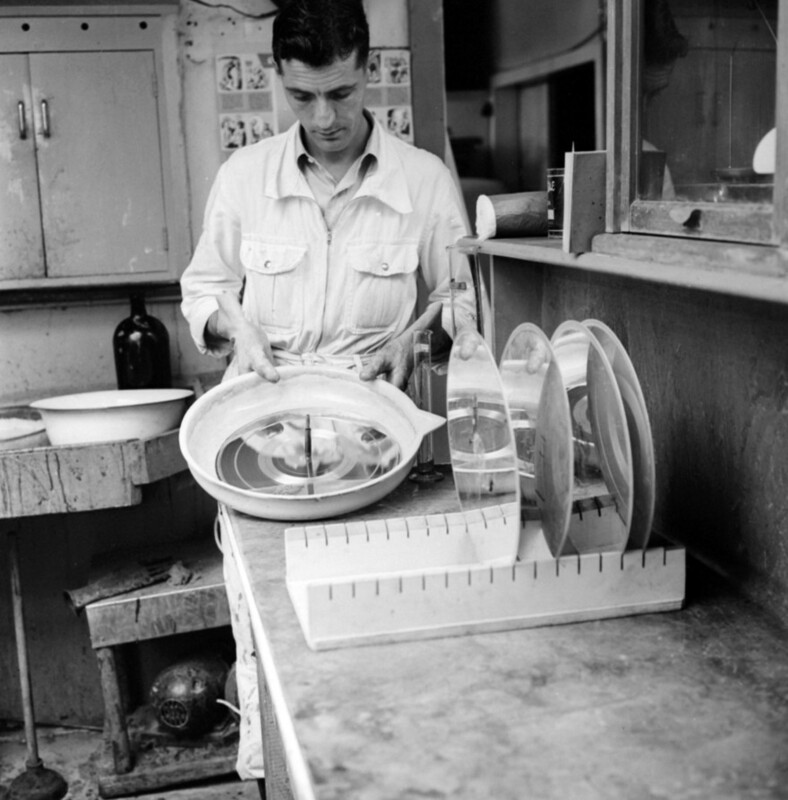 Stompers used on shellac records lasted for about 60-80 pressing before needing replacement. They were of course in reverse. The next process is to peel the acetate away from the copper-backed silver “master”. The silver surface (for smoothness and long life) of the master is the reverse of a normal record. Instead of having grooves, it has ridges. The process to get the “master” is then reversed to produce a “mother” disc, which has a nickel surface and is grooved as an ordinary record. Several “mothers” are made and stored. 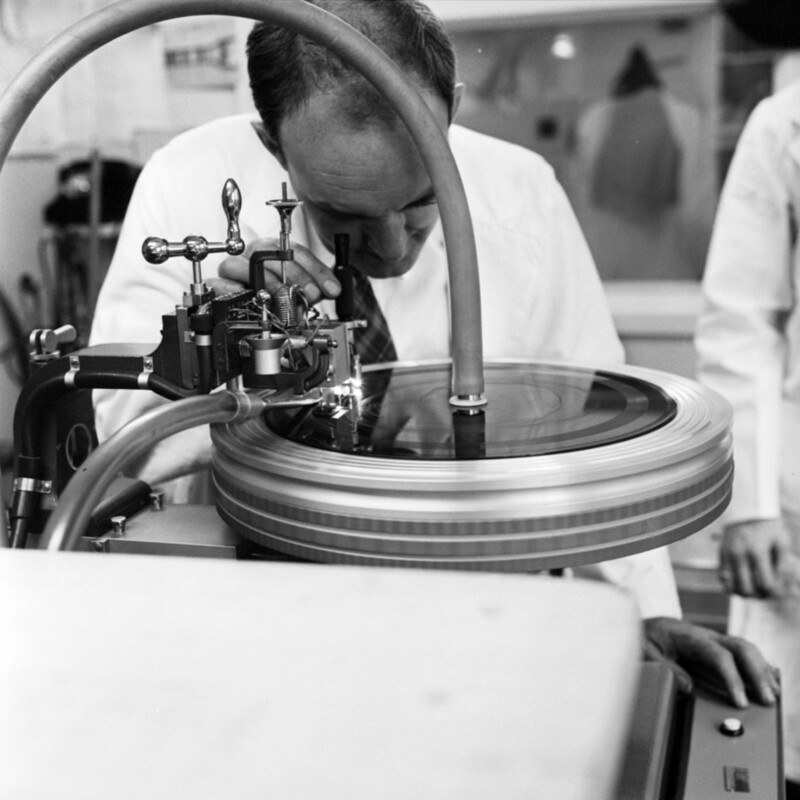 When records are to be made for sale, a “mother” is brought out, tested on a turntable for any defect, and then from it is made a pressing shell, one for each side of the disc. The shells now look like “masters”, with ridges instead of grooves. 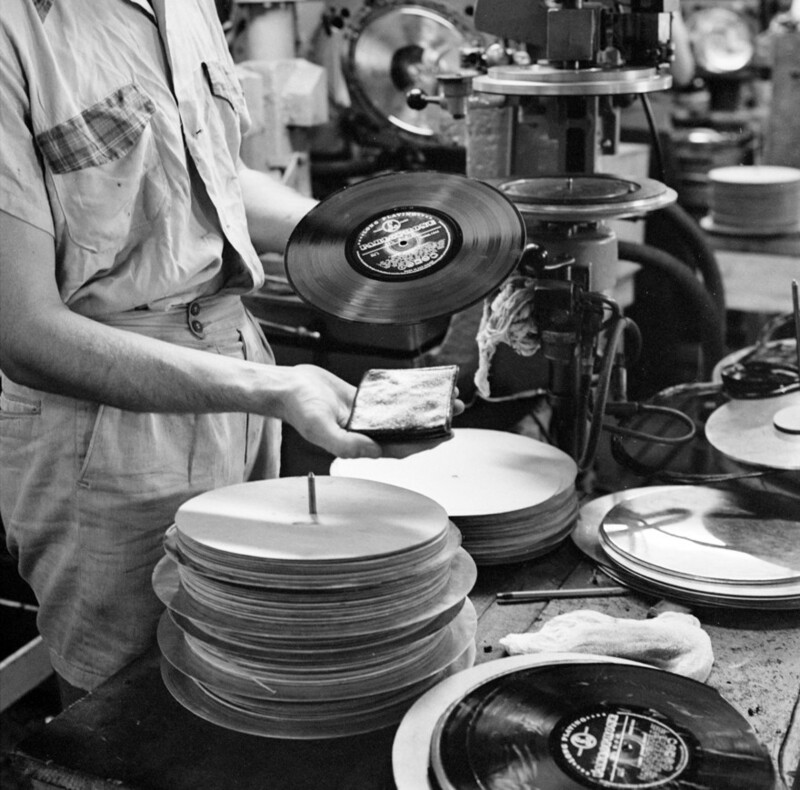 The shells of two sides of a disc are placed in the pressing machine (centre), with the record labels attached. On the level shell is placed a “biscuit” of folded plastic. The pressing machine is brought into action and the folded plastic is squeezed out between the shells and the grooves are imprinted on the “biscuit” – now a record. Pressure is maintained for 30 seconds for long-playing records at 300°F (149°C). The finished article is now ready for distribution to shops. Below the disc is a “biscuit”. Only a relatively small number of discs can be made from a set of pressing shells; that is why several “mothers” are kept from which further shells can be made.